The Calista, at 117 feet long and 105 tons, was constructed in Washington State in 1911. 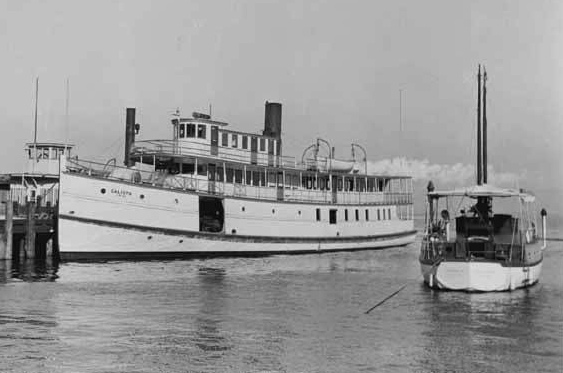 She was one of the small, wooden, passenger ferries common among the early Puget Sound Mosquito Fleet. 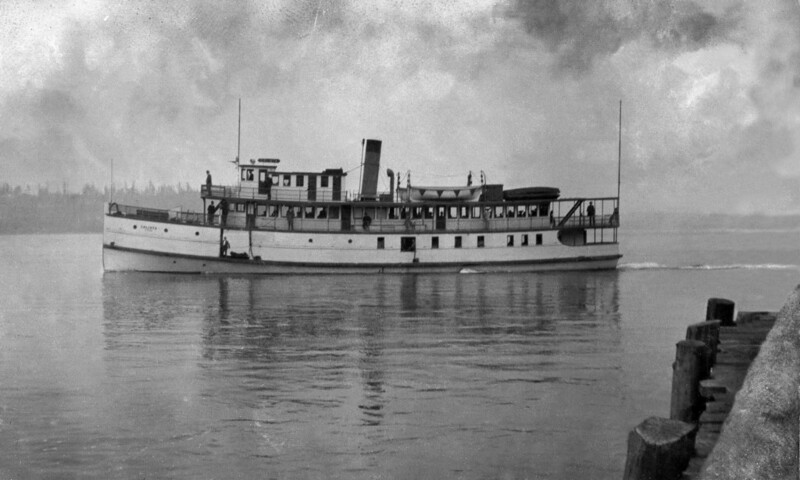 A large number of private transportation companies ran small passenger and freight boats on Puget Sound, nearby waterways as well as local rivers. They were a varied group of steamers and sternwheelers that plied the waters of Puget Sound on an actual schedule and generally stopped at every waterfront dock. On July 27, 1922, the ferry Calista departed Oak Harbor on her scheduled run, pulled into Coupeville, again at Langley, Clinton, and finally Glendale before heading to market in Seattle. One particular South Whidbey passenger onboard that fateful day was Mrs. Margaret McLeod, mayor of Langley. She was accompanied by her coop full of chickens. With a final total of 70 souls onboard, Calista became enveloped in a thick fog as she approached West Point to enter Elliot Bay. It was then, at approximately 10:40 AM, the steamship Hawaiian Maru rammed the Calista which sank to the bottom 28 minutes later. Directly after the moment of collision, the Mayor of Langley fainted. Due to the noble efforts of Captain Bert Lovejoy, Purser R. McGinnis, Ships Mate Ole Swenson and Chief Engineer R. H. Kimmel of the Calista, no lives were lost and all passengers and crew were evacuated to Seattle. The postal mail from all 4 towns, and the chickens, however, were lost. The two greatest fears for any sailor are either a shipboard fire or flooding. For the Mosquito Fleet, if a fire broke out they could try to buy themselves time, by beaching the boat and removing all passengers in a relatively safe manner. Flooding, however, can be caused by an engineering casualty, but more commonly by a collision at sea. 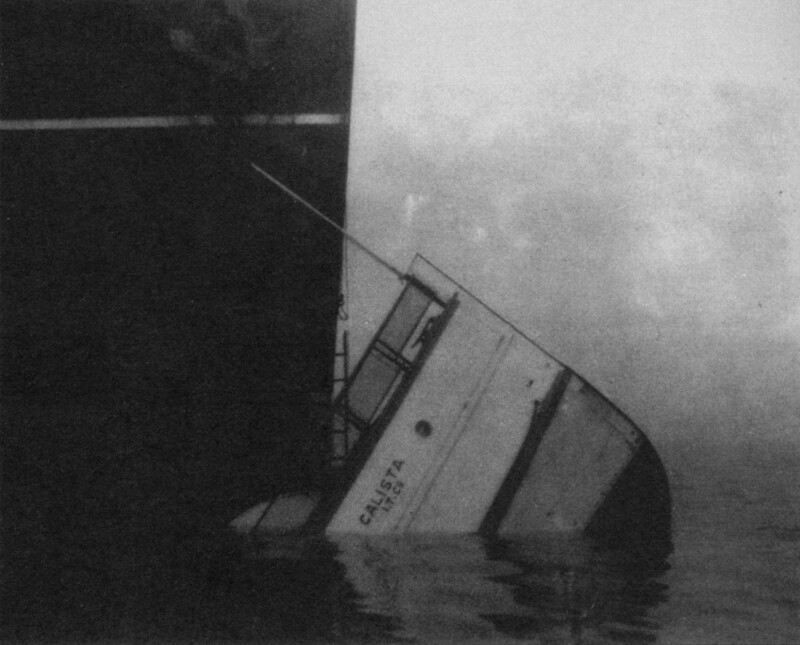 Collisions were not uncommon when steamboats had to operate in fog or night. Up until 1945, when the LORAN (Long Range Aid to Navigation) system was established, navigation was a high-risk affair. Seamanship was an art forged from experience and sound decision making. In today’s navigational environment with instrumentation as sophisticated as radar, depth-sonar and GPS (global positioning system), risks are exponentially less. Collisions in the 19th and early 20th century came suddenly, and destruction could be quick. This is especially the case when there is a difference in size between vessels, or wooden versus steel hull construction. Traffic, fog and geography is, to this day, a hazard for any helmsman. This is why it took a Captain years of navigational experience on a particular route to safely pilot the boat through a fog bank, or into a dark rainy night. Elliot Bay off Seattle was the site of a number of maritime disasters. On the night of November 18, 1906, the passenger steamer Dix (102 feet long at 130 ton), had been designed specifically for very short runs such as its unscheduled transit across Elliott Bay. In steaming from Seattle to Alki Point, it collided with the much larger, 4 masted steam schooner, Jeanie (186 feet long at 1,000 ton). The collision, on a clear night full of stars, may have been due to the error of Dix’s unlicensed mate who was at the wheel. Even though the collision speed was slow, Dix was top-heavy. She heeled over, filled with water, and sank 103 fathoms to the bottom. Forty-five people, including the mate and the Chief Engineer went down with her. The wreck was so deep that no bodies could be practically recovered. A similar collision, again in Elliot Bay, occurred on October 28, 1911. Fortuitously, there was no loss of life, however, this collision is significant because of the obvious standoff between a heavy, steel hulled vessel and a light, wooden hulled sternwheeler. Multnomah was rammed by the much larger steel-hulled express passenger Iroquois on October 28, 1911, resulting in the sinking of Multnomah in 240 feet of water. The Multinomah was built in Portland, Oregon in 1885, and was 143 feet long at 313 tons. The 214 foot long Iroquois, on the other hand, was built in Toledo, Ohio in 1901 and sat in the water at 1,169 tons.